There are a few names that we have started to associate with cheap broadband deals - the likes of Onestream, TalkTalk, Plusnet and joining their ranks, Post Office broadband deals. The familiar name has some of cheapest options out there. Pushing its way into the position of the second most affordable broadband deal currently available, this Post Office offer is one for the bargain hunters out there. Offering average speeds of 11Mb, Costing absolutely nothing upfront and just £15.90 a month - this is a deal only beaten by Onestream and its impressively low monthly costs. 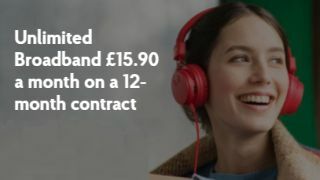 So if you want to get the cheapest broadband from a widely known provider, scroll down to see this deal in full. Or if you're feeling spontaneous and don't want to compromise on your internet plan, consult our fibre broadband deals guide for speedier options. While it is usually better known for its insurance and banking services, the Post Office also does super cheap broadband deals - who would have thought! This offer gets you ADSL broadband for just £15.90 per month, a brilliant price for those trying to get the cheapest price for their internet. What other broadband deals are available? When it comes to cheap ADSL broadband, this is one of the best options out there. The only thing that beats this is Onestream, which is currently the UK's cheapest option at £13.99 a month. But if you need something a bit faster, a fibre broadband deal perhaps? Then there really is no beating BT right now. It starts with monthly costs of £29.99 but then dampens that price with a £30 pre-paid Mastercard and then offers up average speeds of 50Mb - as if that wasn't enough, they are currently throwing a Google Home Mini on top, offering overall brilliant value. For our pick of the most affordable fibre we would offer up TalkTalk. With average speeds of 36Mb, no upfront costs and monthly payments of just £22.50, this is a truly great value package.